Hotel & Resort Booking Joomla Template is based on Helix Framework and SP Page Builder PRO as builder, Layer Slider and for ecommerce J2store LuxStar Hotel & Resort Booking Joomla Template is by far a multi-purpose and responsive theme allowing you to set up your own web page without painfulness with its outstanding feature such as varied header with unlimited styles, drag & drop Page Builder, speed & SEO optimized, custom css, widgets customised, J2store ready, is suitable for Hotel motel website presentation, booking hotel motel website and more. Clean Hotel & Resort Booking Joomla Template with 3 types of header and great features like header switch, RTL language layout, layout builder, multilanguage, ecommerce, quickinstall and more inside. If you have Hotel or Villa and you want to go online, our Hotel & Resort Booking Joomla Template is the best option for you; Simple to install on your server (just need to create your database, user) by friendly interface and fast installation (Akeeba for Joomla). Hotel & Resort Booking Joomla Template is build with the best Page Builder (SP Page Builder PRO) so you don't need to buy extra licence, you can use it with our theme, you can easily build other rows, columns, to add addons into your page, change background image with video youtube, or mp4 video from your server, background gradiend and more inside. Hotel & Resort Booking Joomla Template is one of the best Joomla Templates in 2019 and we hope you will enjoy it. 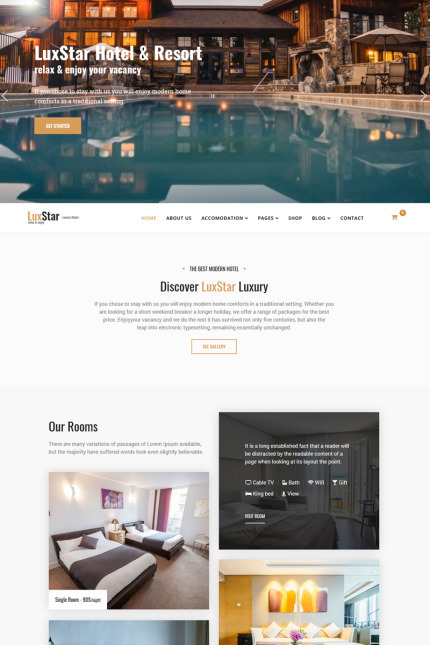 LuxStar Hotel & Resort Booking Joomla Template is fully compatible with J2store, so you can have your shop fast, secure and simple. Try it and tell us what you think about it :). Do you want other Ecommerce? let us know. In our pack, please check our documentation. In documentation, you can find all about LuxStar Hotel & Resort Booking Joomla Template, how to install, configure and more.